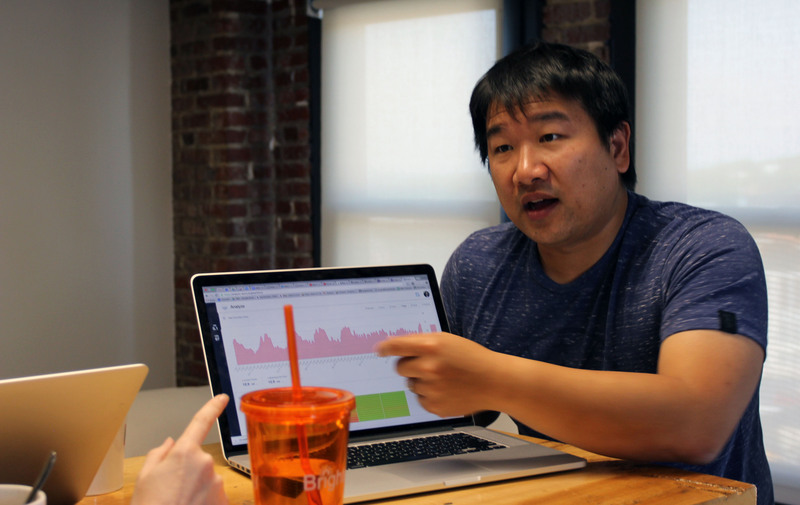 At its core, Brightergy CTO Bruce Wang sees everything he does as problem-solving. And for him, it’s the little things that matter when building a powerful technology platform. Bruce Wang is unafraid to speak—though he may be afraid of heights. The Brightergy team is gathered on a college campus 30 minutes north of our downtown KC headquarters, where we’ve been split up into four groups for team-building challenges. I’m in the same group with Bruce, and we are standing a good 50 feet below the ropes course towers, watching our peers get fitted into harnesses and helmets. For most of us on the ground team, our last choice was climbing up the towers. Instead, the dozen of us are comfortably on the ground (and in the shade) working through a series of challenges deceptive in their difficulty. By the end of the afternoon, we’re all surprisingly comfortable with holding hands. We have successfully arranged ourselves in alphabetical order while balancing on a teetering, oversized seesaw, never letting it touch the ground. Our haste has caused one member of our team to be blindfolded during our journey across a “shark-infested ocean” on rubber stepping stones, their number fewer than the people in our group. Enthusiastic and passionate, his time so far at Brightergy can be marked by exactly that. The result has been a team whose daily meetings are equally filled with laughter, purpose, and philosophical debate. Sitting in the midst of his team in our open office, he is a get-your-hands-dirty and never-take-yourself-too-seriously leader. With my desk only a few rows away, sitting down to talk was a simple task—helped of course, by Google Docs. RS: What led to your interest in computers and engineering? BW: I was interested in computers early on. I was into gaming, understanding how a computer worked, and I was active on BBS—online bulletin boards systems, old school, I know! I took computer programming in high school and then continued on in college. It was something I enjoyed and happened to be good at. My other interests as a kid were science and astronomy. And I was really into both computer and console gaming. My favorite game growing up was Civilization. It’s a turn-based strategy game where you can be any empire and then build it from 4000 BC until past the space age. It allowed you to create new worlds and societies based on your strategy, so it was extremely fun. RS: What was your first job like? BW: My first job was in middle school, delivering the weekend papers in the early morning. I remember my dad modified a pull cart so I could carry a big stack of newspapers, and then I would walk around my apartment complex to deliver them. My first job out of college was at Marimba, a hot software company, doing Java. I learned a lot, and most of my really good friends now are my former co-workers. RS: Are there any “rules” you follow that you’ve learned over your years of experience? BW: Yeah, I do. One of my favorite books is Drive, which described how I have always felt about motivation, but could never articulate. I really believe in autonomy, mastery, and purpose as the key drivers to great team execution. Also related to mastery is the idea of continuous improvement, and having the curiosity and passion to get better. Finally, caring about the “little” stuff really matters. Instead of focusing on the “grand things” that you can do for your team, care about the little things—like making sure you take care of the principal items and are good at them. RS: I like that. Do you have any examples of what the “little” things are? BW: Yes, like documentation. Properly formatted code. Style guides, making sure you have tests—making sure you have functioning tests—making sure you refactor code that you know is wrong. Fixing spelling mistakes in your code and documentation. And never self-merging pull requests: even when you work on a project by yourself or a personal project, what are the things you actually follow to make sure your code is good? The fact that you follow rules even when it’s just yourself is really important. Things like that. RS: What advice would you give to someone looking to get into tech and coding? BW: Don’t let past experience—or a lack of experience—deter you. Even though I was “classically” trained, I believe computer science is one of the few majors you can really learn and become good at by practicing on your own. There’s so many tools available, and all the stuff I do now was learned on the job or on the side. Also, get real-world/practical experience as soon as possible. No matter how many classes you take or lessons you do online, work on real-world problems—and with a team—as soon as possible. This will give you the hands-on experience you’ll need to succeed. Just like Malcom Gladwell says in Outlier, you need 10,000 hours of work to get good at something, so get as much of it as you can. RS: Do you have a daily routine? Why or why not? BW: Definitely more so with kids! I drop the kids off at school a couple of days a week, as well as pick them up a couple days a week, so my days revolve around them. On the days I’m not picking them up, I try to leave fairly early so I can skip traffic and be home by six to have family dinner. Once they’re asleep, I’ll usually work at night. RS: What’s your favorite thing to do with your family? BW: We like hiking, biking, and playing at the park. RS: How do you view your role here? BW: Even though I am responsible for the technology teams here (R&D and IT), I view my role as much more multi-faceted. The beauty of a smaller company is that you get to do a lot of different things. So I get to be part of business/corporate strategy, the product management and marketing process, larger marketing efforts, pre- and post-sales. It allows me to help wherever I can. In the end, it’s all just problem-solving—and usually using technology do so—and it’s something I enjoy. RS: How is that similar or different to past roles at other companies? BW: In my last role I was at a much larger company, and it’s quite different. Even though I had a huge team, a robust budget, and big revenue responsibility, the amount of hands-on work was minimal and I wasn’t able to influence as much as I wanted to in terms of product direction. I really liken my role here to my role at a start-up I co-founded, where there was a need to do whatever it took to keep the business running. Brightergy is bigger though, so it really gives me the best of both worlds. We have the scale and traction of a growth business, but we’re still small enough to do a lot of cool and interesting work. RS: Do you have a career highlight so far? BW: When I sold the company I helped co-found. It was a very long journey, and when we started, I was young and naive—and it was really hard to build a business from scratch. To actually successfully exit, despite it not being “the next YouTube” was a pretty awesome experience. RS: What drew you to Brightergy and the energy industry? BW: Brightergy is a pretty unique company in the Kansas City area. I worked in Silicon Valley for 14 years, where I saw a lot of amazing companies come up, and frankly, when I moved here, I was skeptical of the technology scene. I’ve been pleasantly surprised though, and to have a technology-focused “startup” energy company right here in KCMO is exciting. I’ve been long fascinated with renewables, energy, and IoT, but have never been in it—so getting my experience in this industry has been phenomenal. RS: Why did you decide to use the term “R&D team”? BW: It’s a fairly common practice, but I like the use of “Research” and “Development.” The idea is that you have a balance of understanding your market and exploring new techniques and technologies, and then actual hands-on work developing the code. I think you need both sides: to be able to execute on the code, but to also constantly look at the market to see what new things you can incorporate to make the product better. RS: How is building our platform different or similar to other platforms you’ve built? BW: There’s actually some similarities to the platform we built at Twistage. We created an online video platform, which allowed customers to easily integrate videos into their existing sites and products. It was a purely cloud-based system that need to scale up to handle a large volume of requests. We also had to create a powerful set of API’s so customers could integrate with us easily. Even though the sector and architecture isn’t quite the same, there are some similarities—and my experience with building that and then scaling it up (both technically and team-wise) has been a big benefit for me. RS: What interests do you have outside of those disciplines that influence the way you work? BW: I’m interested in travel and sports. I think both have different influences. Traveling and seeing different cultures and countries opens my mind up to different experiences, and keeping an open mind is very helpful. On the other hand, it also reminds me that despite all the differences, we’re all still human—and this is revealed in travel, but also in engineering. With sports, there are a lot of similarities in the competitive nature and how teams are built and ran with building great software teams. Both of these interests also remind me to enjoy life outside of work, and to have a bit of balance. RS: Do you have a favorite place to travel? A place you haven’t been to yet, but want to? BW: I’m a big foodie, so anywhere with with an awesome food culture is great to visit. I also like historical sites, so Europe is a great place for all of that. Also, once you’re there, you’re able to move around. I’ve been to London, Paris, and various cities in Spain. I’d love to visit other parts of Europe, such as Italy and Greece. Frankly, there’s too many places I’d like to go—large parts of Asia, Australia, etc.—but there’s just not enough time! RS: You’re an immigrant and a non-native English speaker. What has that experience been like, and what have you learned from that? BW: It was definitely hard when I first moved here, but I barely remember it. I was six and I didn’t speak any English, so I had to get a tutor, but I picked it up pretty quickly. There also weren’t many mainland Chinese people where I grew up, so I had to learn how to blend in. I also got moved around a little bit (Delaware, Buffalo, NY, Southfield, and Troy, MI – twice), so I had to get comfortable with people and with making friends despite being different. Also being from a different culture and country has given me a different perspective on things, which I think has helped me with my career. RS: Interesting – what sort of things? BW: First, appreciation for the advantages I’ve had coming to this country. China is pretty prosperous now, but when I came to the states the Berlin Wall was still up and China hadn’t really adopted the “Capitalist” policies it has now. So being educated here and growing up here has obviously helped me with my career. Second, being from a different country taught me to look at things from multiple angles. I understood that people have different views and that you should be open to these views and try to understand what conditions and environments has caused them to have that opinion. It’s never black or white. Really, keep an open mind, not just to other cultures, but to other ideas. RS: Who are your heroes/heroines in real life? BW: This is a toughie. Part of my problem is, how well do you really know these people for them to be your “hero?” I almost feel like it usually has to be a close person, or someone you’ve followed closely for a long time, since that’s the only way you can truly mold yourself to them. I have a few business/tech people I respect such as Elon Musk, Jeff Bezos, Marc Andreessen, and Malcom Gladwell, but they’re not really “heroes” per se. The cliche of my dad being my personal hero is there as well. He grew up fairly poor in rural China, and through sheer hard work, was able to come to the U.S. to study. He built a family and a career here despite not having much. He went through the experience of “having a few dollars in his pocket” when he arrived, and it’s pretty amazing to me. He has a positive attitude and isn’t afraid of failing, which are key characteristics I mold myself by.